In January 2007, Uriah Heep announced that veteran drummer Lee Kerslake was leaving the band due to health problems. Comments Heep lead guitarist and founder member Mick Box: "All the band are fully behind Lee in his efforts to become fully match fit again. For me, it is particularly devastating to lose not only someone who I have worked with for some thirty five years, but also one of my closest and oldest friends who I love like a brother. It is, however, in the best interests of both Lee and the band that a change is made now. This is an important time in the history of the band - We have just signed a new worldwide recording contract with Sanctuary Records and are about to commence recording our first new studio album in almost a decade and it is vital that there is consistency between both the recording and the forthcoming eighteen month long world tour to coincide with the album?s release in September". "URIAH HEEP are delighted to announce that the drummer RUSSELL GILBROOK has joined the band. He replaces LEE KERSLAKE who left the band in January due to health reasons. In June 2008, Uriah Heep released the first studio album in almost 10 years, Wake The Sleeper, heralded an exciting new phase for the band, taking their classic sound right into the future. 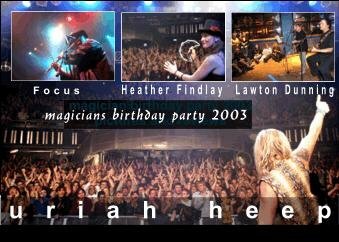 Joining the band was new drummer Russell Gilbrook and the album sees Uriah Heep back to their very best and the band celebrated the 40th Anniversary with an aptly titled re-recordings album called Celebration. The extensive tour that followed saw the band playing up to 250 shows a year to nearly 150,000 people, opening new Eastern European, Australian, Japanese and American tour and playing 53 different countries in total. Capitalising on the success of the tour, the band began a series of Official Bootlegs capturing some of their most enjoyable concerts around the world, in Sweden, Budapest and Japan. In January 2011, the band returned to the studio once again to record �Into The Wild� which began with a strong start in Germany at #32 and the band once again returned to the road for a worldwide tour. 2013 was truly a year of mixed fortunes for the band. Whilst their performance at Download Festival was hailed by all as a highlight of the weekend, sadly Bassist Trevor Bolder died on 21 May. He had been suffering from pancreatic cancer but had been aiming to recover in order to perform the Download show. Sadly that was not to be. He was 62 years old and his passing was marked by all of the major music titles and most national newspapers. If the history of Heep proves anything though, it is that the band will endure. Dave Rimmer, who had been standing in for Trevor, will continue as bassist and with the band�s diary for the foreseeable future as full as ever, the whole band will be busy. Rehearsals have started for the recording sessions of a new album, to be released through Frontiers, and the material is sounding amazing. Uriah Heep � still �Very �eavy, very humble�. Still essential. Talk to Mick Box (and if you get the opportunity then do so, because he'll certainly talk back) and he'll reflect back on the history of Heep with a glint in his eye and a smile on his face (after selling millions of records he's entitled to), and like any seasoned traveller who's just returned from a momentous journey he'll, along with Lee Kerslake, Trevor Bolder and indeed, Ken Hensley, recall the highs and lows, ups and downs, with genuine affection. And you know what? They won't have regretted a single minute of it. They've had their share of 'appy days alright, but they're not over yet, that's for sure. 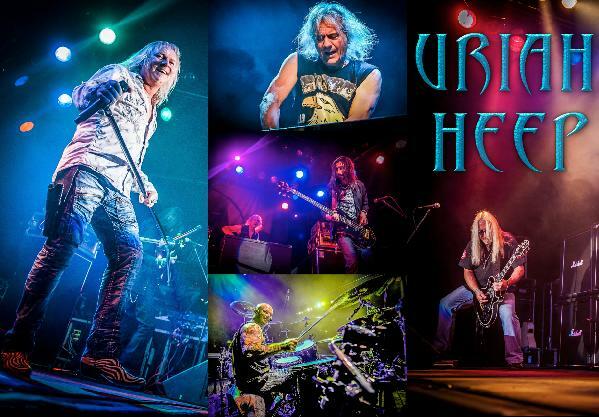 Copyright © 1996-2019 www.uriah-heep.com. All rights reserved.